Your deck is all done! Whether you’ve done it yourself or hired an external contractor, your brand new timber decking is ready to enjoy. But the hard work doesn’t stop here. Good quality hardwood needs to be properly maintained. Let’s check out how you can get the most out of your new deck. Your decking can always benefit from a good sweep. Use a large, stiff broom that’s specifically designed for outdoor use. The idea is to get rid of any loose dirt, dust and debris. We recommend sweeping once a week. As well as removing any surface dirt, a good sweep will also prevent water and dust from drying out your good quality timber. This is a must for any Brisbane home with decking. Get a big bucket of warm water, and mix in some bleach. 500 ml of bleach to 10 litres of water should be just about right. Pour the whole thing all over your deck, taking care to spread it evenly. If you have some very stubborn stains, try some more bleach or a specialist deck cleaning solution. Then get to scrubbing. You can use a stiff, large broom or a large brush. If you have really stubborn stains and marks, you can sand them off instead. If you are going to sand, clean the decking first. Otherwise, you can risk rubbing dirt into the timber boards while you sand. This is actually one of the most important aspects of good deck care and maintenance. Oiling your deck helps to preserve your timber. It also protects it from the UV rays. This is especially important in Australia with our high levels of sunlight and UV exposure. Sunlight can dry out and damage your boards. Staining is another vital aspect of deck maintenance. Staining your timber decking gives it a vibrant, deep, and amazing finish. It adds colour to your timber, and will help to bring out the natural grain of your hardwood. After all, you’ve chosen timber decking for a reason! They look great. Try choosing a stain that also provides UV protection and weather resistance. This will help keep your decking from fading, greying and looking worn out. 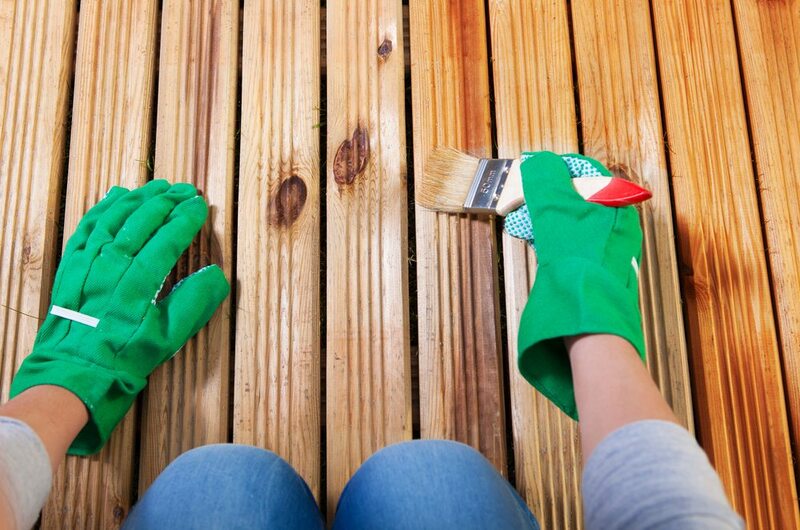 To stain a deck properly, start from one side and work your way across. Make sure to cover one board before going to the next. This way, you’ll get a smooth and even finish without those unsightly blotchy marks. After all, you want your deck looking its best. The Sunstate Timbers team are the decking experts for all your needs. If you’ve got further questions about deck care and maintenance, feel free to come visit us. You can also give us a call with any questions you may have. We’re always up for a chat about your next project.